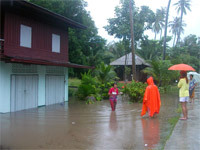 You are here: Home > High Alert > HELP – Massive rain floods Koh Phangan Paradise Island! 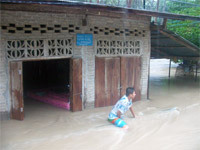 HELP – Massive rain floods Koh Phangan Paradise Island! Didn’t we all think that we somehow got serious water problems here on Koh Pha-Ngan Paradise Island in the Gulf of Thailand? Well … at least at the moment there are plenty of water supplies available in most critical areas of the island. 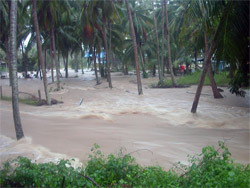 Koh Phangan just got hit by a low pressure area the last couple of days and it resulted in lots and lots of rain for the last 3 days. Becki has never seen that much rain in the last 10 years and it was a quite impressive and awesome experience, reminding us of the power of Mother Nature! 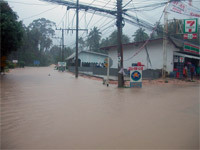 Most areas of Koh Phangan like Baan Tai, Baan Khai, Thongsala, Sri Thanu, Wok Tum and so on were flooded to a high critical level! Also the main road access from Baan Khai to world famous Full Moon Party beach Haad Rin is temporarily closed at the moment due to recovery work. Massive rocks got washed out by the rain blocking the road. 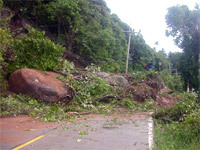 Landslides … mud … stones on the road … overtaken trees and electric pylons created a TOTAL DISASTER! Even while writing this article the electric power supply on Koh Phangan shuts down from time to time. The situation here is indeed more than critical! Washed out bridges … collapsed roads … flooded houses … what else did we ask for? 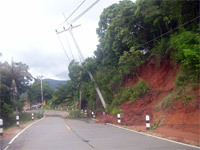 Haad Rin village, the host of the monthly Full Moon Disaster Event, even received severe damage! 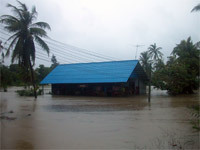 Unfortunately Becki couldn’t have a look there as the road is blocked at the moment but the word on the street is that the lake embankment at Haadrin village collapsed and flooded most of the shops located close to the pier leaving to Koh Samui Island! 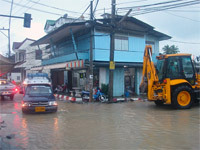 Thongsala main village also experienced a massive traffic chaos as our brainiacs from the local district office decided to do some deep digging in the middle of the raining season. So the re-construction work in main village Thong Sala created another chaos which perfectly blended in to the natural daily insanity on Koh Phangan Paradise Island! So … DO NOT HESITATE and DONATE NOW! 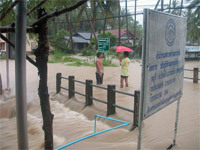 Help us re-build the infrastructure on Koh Phangan Paradise Island! Help us send food and medical supplies to the most critical areas of the island! Help us finance a ‘Koh Phangan Live Aid Concert’ to show our solidarity with the poorest folks on this wonderful island while still making massive profits! SUPPORT US and MAKE A DONATION – NOW! 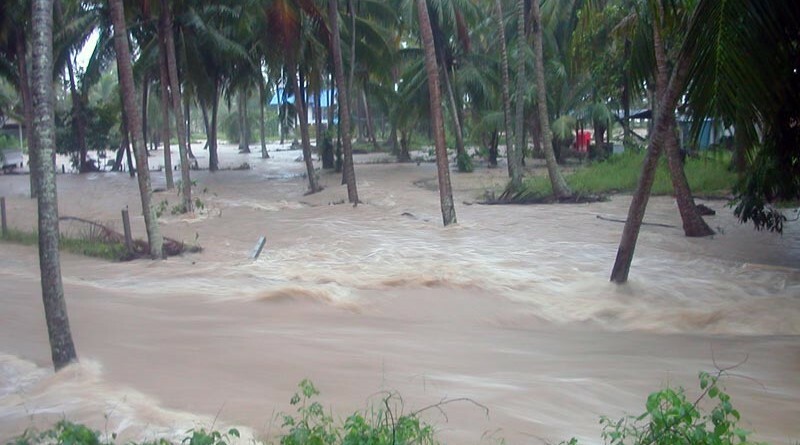 Thanks to our brave and honored undercover agent Patrik from the Baancom Headquarters in Baan Tai village we even got a ‘live video feed’ from the recent flooding disaster on Koh Phangan Island! So … again … DO NOT HESITATE and download the movie to your local hard drive for further inspection. 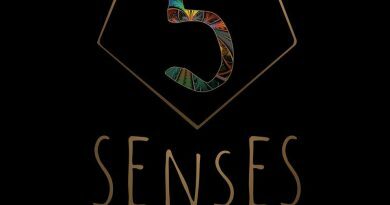 We got altogether five movie sequences available for you! 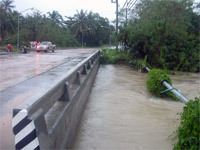 Three sequences during the high flood in Baan Tai area next to Baancom headquarters and another two sequences after the heavy flooding went down a bit to show you the difference. Enjoy! By the way, Baancom offers exceptional computer services and repair! If you’re planning to bring your laptop to Koh Phangan and run into any problems or whatsoever then Baancom is the first address on this island! Patrik is an experienced software engineer and familiar with the exciting world of Microsoft since more than 20 years. He offers professional advice not only on Windows operating systems but also on Mac OS and everything else related to the fascinating world of computers. To get more detailed information please visit the website of Baancom.com or dial 077-238124 – thank you! 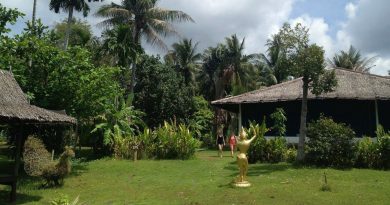 ← Koh Phangan Island News Headquarters receives first donation ever! I lived on KPG for a year a couple back and made many friends. 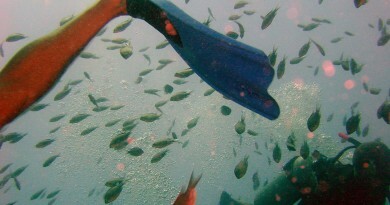 Upon seeing these puictures I called a Thai friend who lives in Ban Kai to ask if she was Okay…..
Fine she told me, just the same as every year on Koh Phangan! Is it worse than previous years??? Please let us know an update on the flooding. Ok, 10 days after katastrophy now! How is the situation at the time? Well, once again an OTT posting from Koh Phangan news! Flooding is pretty much gone, electricity was restored in less than one day to most parts of the island (Hadrin took 2) and the Hadrin road reopened within 2 days. But hey, the whole idea of a major disaster here is much more exciting . Reading this in July-I just will qoute you “donate 500 Baht ($10)” Now at this I’ll see your 500 Baht or more for $10! Good bargain for me not for you? 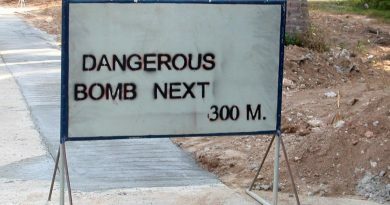 or what????????????? ?